How many children will have to be maimed before all of Canada's provinces ban pit bulls? The question has weighed on me since Boss, a five-year-old pit bull, nearly tore the nose off Cali Leclair, a 14-month-old Ottawa girl, possibly affecting her breathing for the rest of her life. Boss had to be pried off the little girl's face. Initial accounts from paramedics stated that the dog left puncture wounds so deep that they exposed bone underneath, according to Postmedia News. Cali's mother had taken the dog into her home with the hope of rehabilitating it, according to one neighbour, after he had bitten the previous owner's child in the mouth. Boss was euthanized after the vicious attack. The police have established no criminal element and have ended their investigation. While this incident shows that enforcement of Ontario's pit bull ban has not been 100 per cent effective, it should not take away from the overall effectiveness of legislation that has made people safer from dog attacks in two provinces. The rest should follow, post haste. Full disclosure: I'm afraid of pit bulls. I have been since I was seven years old, when I witnessed my mother being bitten by one on the leg, totally unprovoked, as she walked into a corner store. Since then I have harboured a fear of the breed, so much that I'll sometimes cross the street to avoid one. Now I don't think that pit bulls should be banned just because of my experience. It's because hundreds of people have been killed by a breed that is responsible for a majority of attacks, despite making up a minority of the dog population. The statistics around pit bulls reveal a disturbing pattern. From 1982 to 2013, pit bulls or close mixes were responsible for 1,777 maimings, for 64 per cent of all such injuries in Canada and the United States. Fifty-one per cent of dog-related deaths (275) have been attributed to the breed, as have 67 per cent of attacks doing bodily harm (2,990). If that isn't staggering enough, consider that the next most dangerous breed, the Rottweiler and its close mixes, were only held responsible for 319 maimings and 85 deaths in the same period. The data was obtained from press accounts that were cross-checked by date, location and identity of the victim by Merritt Clifton, editor of Animal People. And the statistics show a problem that's growing worse. The number of pit bull-related maimings has increased from 54 in 2002 to 407 in 2013. The story is similar when it comes to pit bull- or mix-related deaths. There were six recorded in 2002, and the number of dead has hovered from 20 to 30 in the last four years straight. The numbers suggest that when a dog attack happens, it's fair to assume which breed is responsible. In spite of these statistics, pit bull advocates continue to insist the dogs are loving, nonthreatening animals. Dog advocates like Ontario MPPs Randy Hillier and Cheri DiNovo have called on the Liberal government to lift the province's ban on pit bulls. DiNovo argues that German Shepherds, Labrador retrievers and Chihuahuas are just as capable of biting as a pit bull, CTV News reported. Which is, of course, besides the point. German Shepherds and their associated mixes have only maimed 98 people in over 30 years of reported cases. You have to multiply that 18 times to arrive at the damage that pit bulls have done. The dogs are so dangerous that even some of their most prominent advocates can't sugarcoat the risks they pose. The BCSPCA says a pit bull ban would not work, but general manager Lorie Chortyk admits that, "the reality is they do have very strong jaws and they can do more harm." Cesar Millan, TV's "Dog Whisperer," describes an "extra boost" that fighting breeds such as pit bulls have: "See the rest of the breeds, they can feel physical, psychological, and they surrender, but the fighting breeds, they don't feel it." But how would a pit bull ban work? It's simple: provinces could enact legislation similar to what has already worked in Manitoba and Ontario. The Prairie province passed breed-specific legislation in 1990. Since then, researchers at the University of Manitoba have observed a significant drop in dog bite injury hospitalization rates throughout the province. Ontario passed its own ban in 2005, and it's working too. Public health statistics showed that 486 bites were recorded in Toronto that year, falling to 379 in 2010, Global News reported. Bites blamed on the breed dropped significantly, from 71 to 2005 to six in 2010. 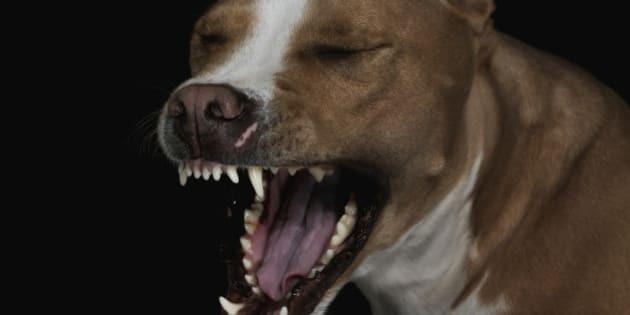 "The total ban on pit bulls is not grossly disproportionate in light of the evidence that pit bulls have a tendency to be unpredictable and that even apparently docile pit bulls may attack without warning or provocation." A pit bull ban in every province would not be illegal. It would not be unconstitutional. It wouldn't even really assume that all pit bulls are inherently bad. It would simply take stock of overwhelming evidence, as all good legislation should do.